Oops! I forgot to add Google Analytics and Site Meter code to my new WP template files! Added SIte Meter on Saturday and Google Analytics today. But there will be a data gap from June 4 through today as a result. Today I also added several Amazon links to the sidebar. This is the first time I have put anything like advertising directly on this blog. I decided to label it “Advertising,” because that’s pretty much what it is. These are products I recommend. Changed WordPress theme to Fiver. This is an HTML5 and CSS3 theme! Update: The CSS style sheet on this theme is very clean and easy to edit. I have changed almost all the colors and all the fonts. The one thing I liked least was the author’s use of letter-spacing (but that’s easy to change). I would like it to have a widget-ized footer — and it has only one sidebar, with one option for placement. Nonetheless, I am really liking this Fiver theme! Added TwitterCounter to the sidebar. Added the Super-Cache plug-in. This is supposed to make viewing the blog faster; pages should load more quickly. Also, I was having memory-use issues at Dreamhost, and support sugested that maybe I should use a cache. I did have the regular WP-Cache enabled, but I guess that wasn’t cutting it. Added the Most Commented plug-in from Nick Momrik. You’ll see the list in the sidebar: Posts that have received the most comments on this blog! A while ago, I upgraded to WordPress v. 2.7. I guess I forgot to add a note to this page when I did so. Upgraded this blog to WordPress v. 2.6.1. Now I can use the iPhone WordPress app and blog from my phone! W00t! Added some social bookmark links to the posts and my feed via FeedFlare (at FeedBurner). I was seeing some good results from StumbleUpon and it seemed like a smart idea to make it easy for readers to “stumble” me. Added a Windows Live translation option into the sidebar. I saw this on Marshall Kirkpatrick’s blog and really liked it. (I know, it’s shocking if you know how much I usually bash Microsoft.) The European and Asian languages work fine in Firefox, but Arabic didn’t work (sorry!). Updated my blogroll: Removed all links to sites that have not been updated in many weeks or months, and added link titles to each link to make the list more useful to site visitors. A fair number of people click these links, according to my site stats, so I hope this helps. Added the WP-ContactForm: Akismet Edition. Tweaking the CSS and the form labels was a bit of a pain, but the form is quite nice. See it here. Added the WPvideo plug-in for embedding YouTube and other videos inline. It was recommended in BlogCritics. Easy to install and worked fine out of the box. I went into the PHP to modify the CSS that controls position and to delete some stuff I did not want. Crossed another detail off the blog To Do list: I rewrote the ActionScript on the Flash gallery that appears at the top of every page so that I can now change the contents of the three slots just by changing the text in an external XML file. Eventually I might put a randomizer on it … but not yet! If you want the AS, e-mail me. Finally created a custom bullet for the sidebar. I know — it’s not very exciting. What’s worse, I discovered that LI’s and the list-style-image do not play nicely with line-height (all this is CSS jargon). I addressed it with one added selector in my IE-6-hack stylesheet (see entry below from 11 July). Added the plug-in for the 1 Pixel Out audio player. See example in this post. Added the BDP RSS Aggregator plug-in. Sweet! Highly configurable. Feeds appear in my footer. Added the Get Recent Comments plug-in by Krischan Jodies. Very nice. 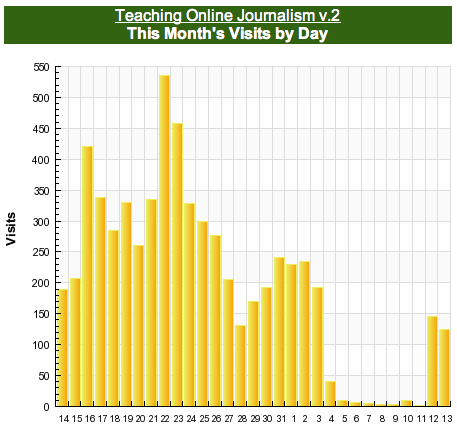 Changed the Site Meter chicklet to show number of visits — because it has topped 10,000! Woot! (The old blog at Blogger has 90,662 as of today.) Traffic is creeping up steadily. The move to WordPress didn’t kill my blog. Added categories to all posts from June 2006. Checked all comments posted from December 2005 through June 2006 for port errors and spam links. All good. Designed and built mini Flash “gallery” for the page header. Added categories to all posts from April 2006. So it turns out that the hacks that fix stuff in IE6 (world’s most stupid Web browser) break in IE7. I had this 12-pixel margin offset problem with the sidebar on this blog. The only way to fix it: Create a separate CSS style sheet just for IE6 and older. Here is the page that helped me the most. It seems to work great. I had to get this Multiple IE installer to test IE6 and IE7 side by side. Finally got the RSS feeds working right. What a stupid bug! Added WP categories to all posts from March 2006. Took about 40 minutes. Now there are only 399 “Uncategorized” posts left to edit. Improved the 404 error page. Tried (again!) to figure out the feed problem. If I install CompleteRSS, I get a full-text feed. However, all the entries in every search and archive in the blog then also show as full text, which is really bad. So I uninstalled CompleteRSS. I have full text for feed posts enabled in the WP Admin panel. I have “the_excerpt” instead of “the_content” in the PHP in my archives.php page. I do not use <!--more--> (it’s a WordPress thing), and from what I have read, I do not think adding <!--more--> would fix this problem. I’m really stumped. Added linkroll from del.icio.us (in the Footer) and styled the list. Styled Sidebar H2’s to be consistent with Footer H2’s. Fixed inconsistencies across postmetadata divs. Feed is truncated again. Grrr!! Tried WordPress widgets. Did not like them. (Mystery meat!) Took them out again. Installed the Fuzzy Recent Posts plug-in so I could show recent posts in the Sidebar. Styled UL’s, OL’s and LI’s for posts. Tested in Firefox 2.0 and IE6, only on Windows. Added category tags to all posts from December 2005 through February 2006. Tedious but necessary. My plan is to go through all the posts and then cull the categories that have fewer than five posts in them. Upgraded WordPress install to WP 2.2.1 at Dreamhost. The upgrade seems to have gone smoothly. Thanks to DH’s One-Click Install, it took about 10 minutes — maybe less. Viewed site on Windows system with Nvidia graphics card. Colors are a bit weird looking: aqua turns blue and the browns go to gray. Feh. Designed and added new top navigation. Tested in Firefox 2.0 (Mac, Win, Ubuntu); Safari (Mac); IE 6 (Win); Opera (Ubuntu). All good. Whew. Made the tabs dynamic thanks to a nice snippet of PHP script from Mike Cherim. Uninstalled Full Text Feed and installed CompleteRSS. Still trying to fix truncated feed posts. Installed Full Text Feed plug-in to fix truncated feed posts. Fixed embedded YouTube videos by replacing bracketed text (generated during port from Blogger) with Object code from YouTube. Fixed float/margin problem in IE6 with a creepy CSS hack from DrDoc. This may not be the best solution, but I tried a lot of other things and none of them worked. The problem was in the position of the right-rail sidebar. I had a 12-pixel right-margin offset in IE6 that did not occur in Firefox 2 Win/Mac or Safari. Added border to images in posts. Added some chicklets to the sidebar. Made WordPress site live; changed FeedBurner feed; edited Blogger page to reflect the move.